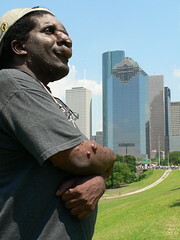 Reggie Bibbs is on a quest to spread awareness of neurofibromatosis by going out into the community and attending large public events to get the word out about NF. His is a grassroots campaign based on his commitment to the cause and incredible resources like the internet, Flickr, YouTube, MySpace, Vimeo and other viral messaging systems. And a shout out to Lou at Stan and Lou Advertising for the introduction and for all of their work for NF.